In today’s busy world, parents need a helping hand to teach their children a Biblical faith. Since 2013, we’ve been creating Bible stories and resources to help parents with this important job. 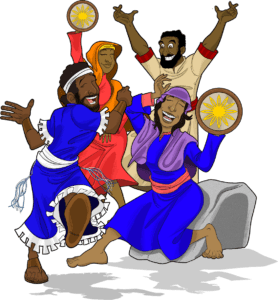 Our Bible stories are fully illustrated and come packed with fun facts and fascinating archaeological, historical, and cultural discoveries. We’ve designed hundreds of free printables for teachers, educators and parents – available free of charge in our ACTIVITIES section. How can you help? Consider supporting our Ministry today with a donation via Paypal. We’re passionate about offering our Bible stories, teachings, and printables to families and fellowships around the world for FREE. Your financial support provides funding for missions projects and the creation and upload of more Bible stories and discipleship materials. 100% of donations goes towards creating these resources – nothing is taken out for admin expenses or overheads. If you feel led to support Bible Pathway Adventures please do. Your generosity helps meet the costs of our ministries and makes outreach efforts possible. Click the DONATE button to donate via Paypal. Or support us by purchasing our print and Activity Books in our online store or TeacherspayTeachers.com (click the TPT icon below). After microscopically checking out their website, I feel 100% confident about purchasing their products and incorporating them into our homeschooling plan! So glad to find others who are passionate about helping our children learn about Abba and Messiah!! I love all the bible stories…it sure makes me feel like a kid again with so much animation …and most of all, true events coming alive. Wow…go Bible Pathway Adventures!! I cannot thank you enough for your ministry! I teach elementary school age children in my life group on Sunday mornings. The biblical accounts that you have brought to life are what I use to teach.